The first evidence showing important landscape differences in the flammability of plant leaves, as fuels available for bushfires, indicates that gully plant communities are likely to be at increased risk under climate change and increasing bushfire frequency and intensity. Research from the University of Technology Sydney (UTS) shows that plant communities in gullies are much more flammable than plant communities on ridge-tops. Ecologist, and lead investigator of the study, Dr. Brad Murray says that the results of the research into plant flammability are of serious concern, because "all sorts of animals have normally used gullies as refuges during bushfires." How environmentally selected variation in leaf traits, such as leaf area (LA) and leaf mass per area (LMA), drives variation in leaf flammability at landscape scales has remained largely unknown until now. 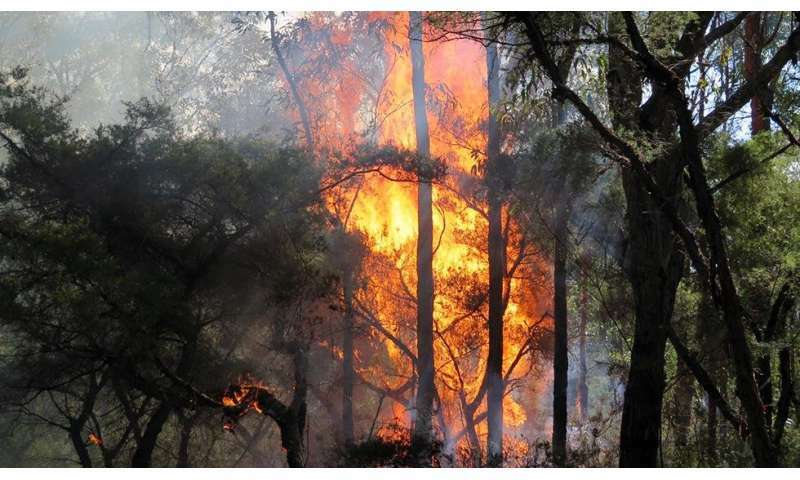 The study compares leaf traits and flammability characteristics between species of sheltered forest vegetation (low light, moist habitat) and plant species of exposed woodland vegetation (high light, dry habitat) in a fire-prone landscape of south-eastern Australia. The researchers found that leaves of sheltered forest species were significantly more flammable due to both higher ignitibility and combustibility compared with exposed woodland species. "These significant differences [in leaf ignitibility and combustibility] are reinforced by sheltered forest species having leaves with significantly larger LA and lower LMA compared with exposed woodland species," says Daniel Krix, UTS School of Life Sciences Ph.D. student and lead author of the study published in Ecosphere. Sheltered forest habitat tends to burn less frequently and less intensely than exposed woodland, however, projected changes to climate will allow wildfires to overcome the once protective nature of gully topography, the researchers say. "Wildfire frequency and intensity is projected to increase which means that higher leaf flammability in sheltered forest species has the potential to exacerbate the effects of changing weather conditions to place sheltered forest habitat, their plants and their animals, at even higher risk of catastrophic wildfire," Dr. Murray says. "If the gullies are becoming more at risk of going up in huge fires, then where will the animals go?" he says.